This hike combines the Atlas valleys and the Sahara will allow you to immerse see yourself in the heart of the Berber life and the life of the nomads. Terraced fields, dry stone houses, scenes of farm life, an opportunity to experience a different lifestyle while filling your lungs with pure air. Morocco is an ideal country for hiking. The Atlas is one of the finest mountains on the planet, yet well protected certain evils of modernity and housing a population proud of its Berber culture. The Moroccan Sahara, while being one of the most accessible, has the advantage of offering a wide variety of landscapes: dunes, oases, valleys – palms getting lost in the desert … In the Atlas, we organize excursions with mules and in southern Morocco trekking with camels and camel rides, an approach well suited to a family trip in the Sahara. In all cases, this trekking is accompanied by our own teams and supervised by Moroccan mountain guides certified. As in sports your hike, it can be very committed, sporting or quiet. Around 8 H morning transfer directly to Imlil (1740m) at the foot of the massif of Toubkal, the starting point of our trek. We begin our journey with a climb that leads to Tizi N’Tamatert (2279m). On the way, we enjoy beautiful landscapes typical Berber villages. We continue our walk to reach Tacheddirt village where you can spend the night in a guesthouse. After breakfast we leave the imnan valley ,towards the coulorfull valley which is Azzaden one,we pass by several villages ,and passes Aguersiwal pass 2100m and Oudit one 2200m,to get to Ait Aissa In the evening, there is a gite to stay in and a steam bath (hamam) if you would like to use it. 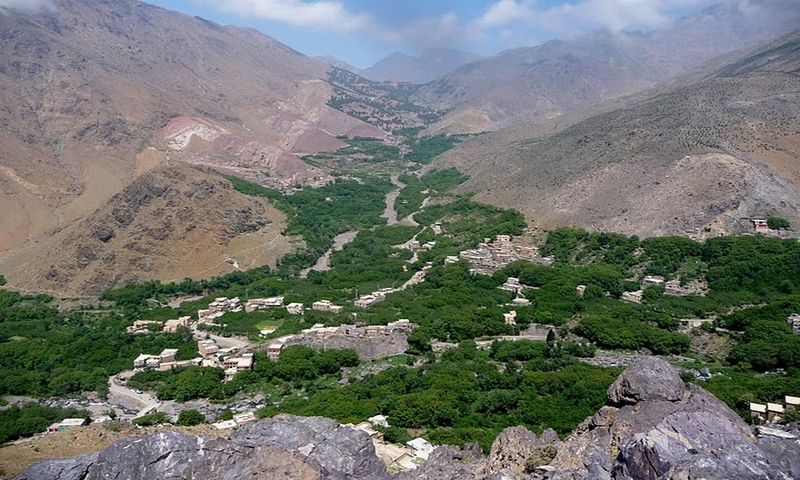 After we head to the imlil valley we will first go to visit the biggest water fall in the toubkal region,then go up to join our mule in tizi Mzzik 2500m,lunch here, and trek down the to end of our trek in imlil. Night in our Guest house ( private rooms with private facilities),including Dinner and breakfast. You will be picked up from your accommodation in Imlil at 9.00am and head out over the Atlas Mountains, driving over the stunning Tizi-n-Tichka mountain pass. 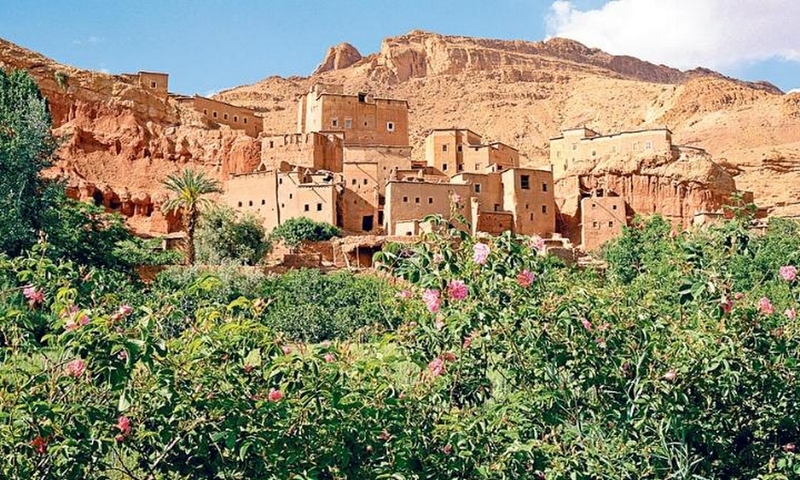 You will pass lots of spectacular views and lots of beautiful Berber villages before you get to the desert, at which point the scenery will transform into riversides of oases and kasbahs. Along the way, you will have the option either to take a break and visit the Ouarzazate Film Studios or stop for a hike. 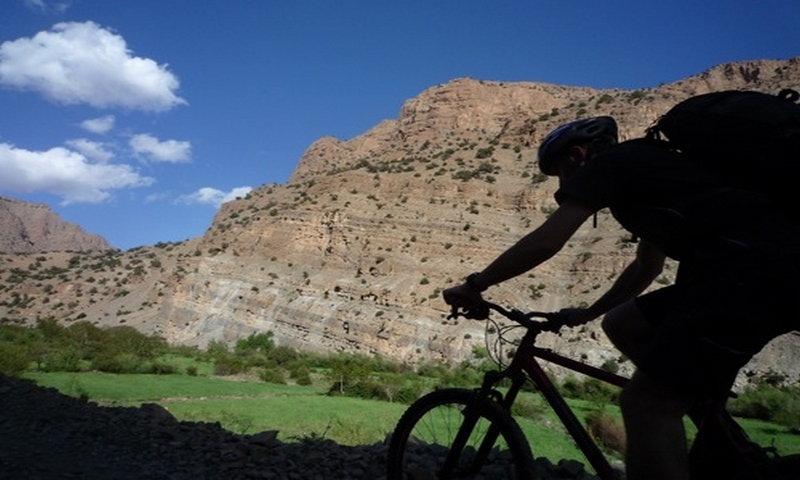 Once you reach Dades Gorge, you have the option of going for a hike or relaxing at your hotel. Overnight in Dades. Breakfast at the hotel. 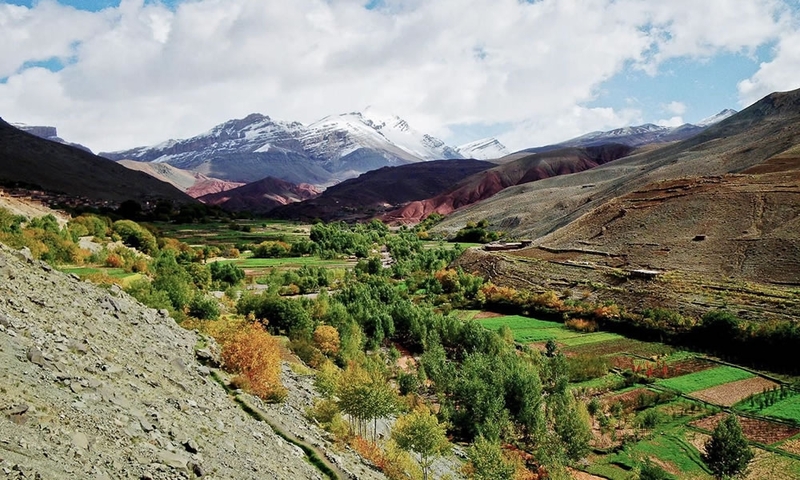 Transfer from the Dades Valley to Todra Gorge – a massive fault dividing the High Atlas mountains, rising up 300 meters in a narrow valley with palmeries and Berber villages. After your lunch, you will head deeper into the desert, to a tiny village called Merzouga, where you will trek overnight with the camels (you will get to sleep, do not worry!) 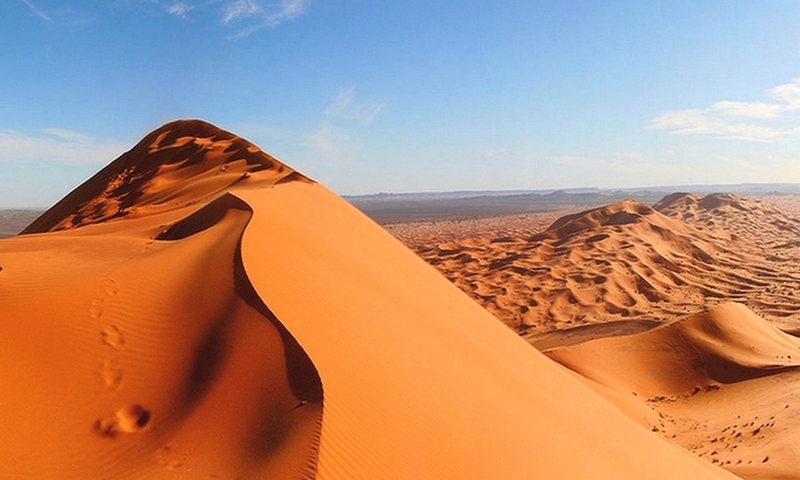 to the beautiful Erg Chebbi dunes – the highest dunes in Morocco. At sunset, you’ll trek for an hour-and-a-half by camel to a Berber camp where you will enjoy a traditional Moroccan dinner, and sleep under the stars or in tents at a desert camp. Wake up early , just prior to sunrise, we have a 1h30 camel ride at sunrise to explore the area further and we head back to Merzouga on our Camels. 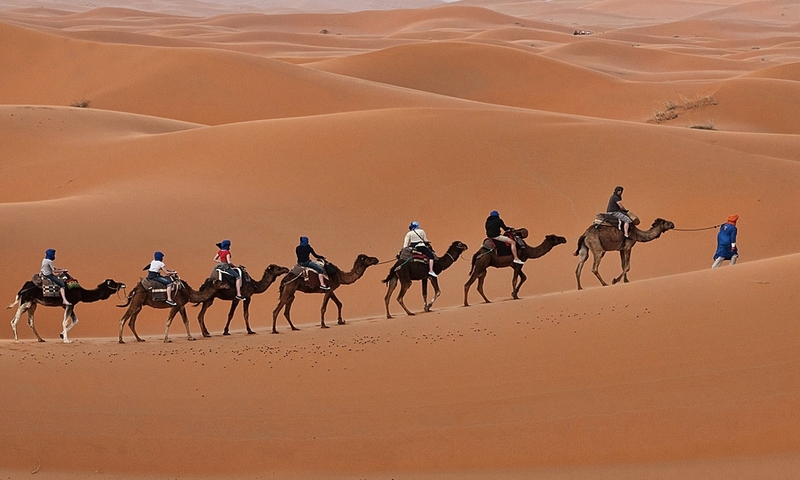 You will then journey by camel back to Marrakech to arrive in the evening.